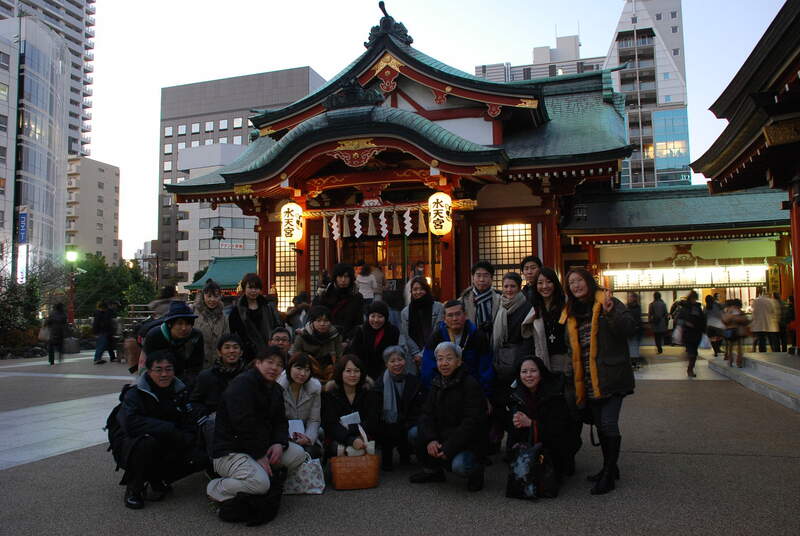 The collective theme for the Lighting Detectives this year is “gathering.” To start off the New Year, club members gathered to visit the seven shrines of good fortune near Nihonbashi, Tokyo. While the pilgrimage is called “The Seven Shrines of Good Fortune,” there are actually Eight as the God of Fishermen, good fortune, commerce, and honest labor, Ebisu, is enshrined in two of the shrines along the tour. 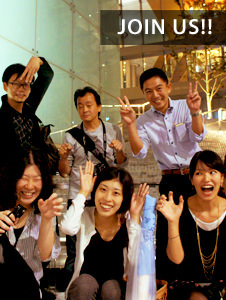 The group gathered just before dusk at Suitengu Shrine. From there we visited Matsushima Shrine, Suehiro Shrine, Kasama-inari Shrine, Suginomori Shrine, Takarata Ebisu Shrine, Koami Shrine, and Ochanoki Shrine. With map in hand, the detectives set off to discover what kind of lighting environments each shrine portrayed. 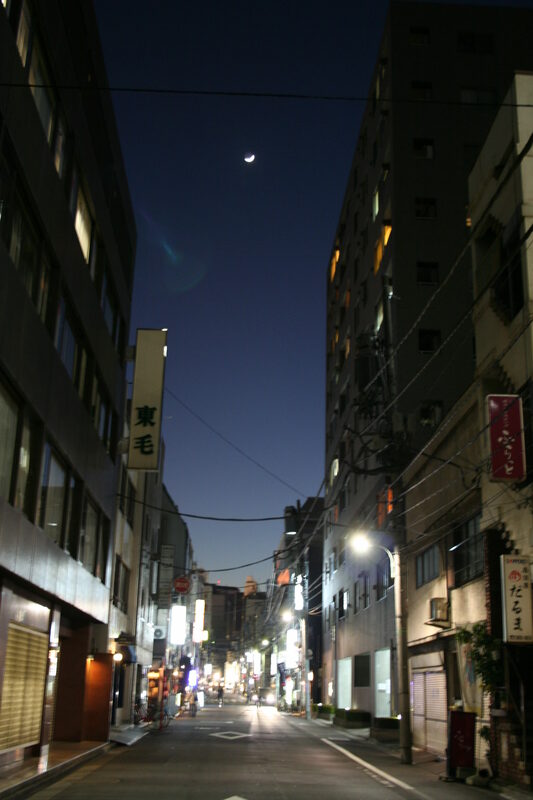 The back streets along the way were dim and we had to stop under the fluorescent street lamps every so often to check our progress. 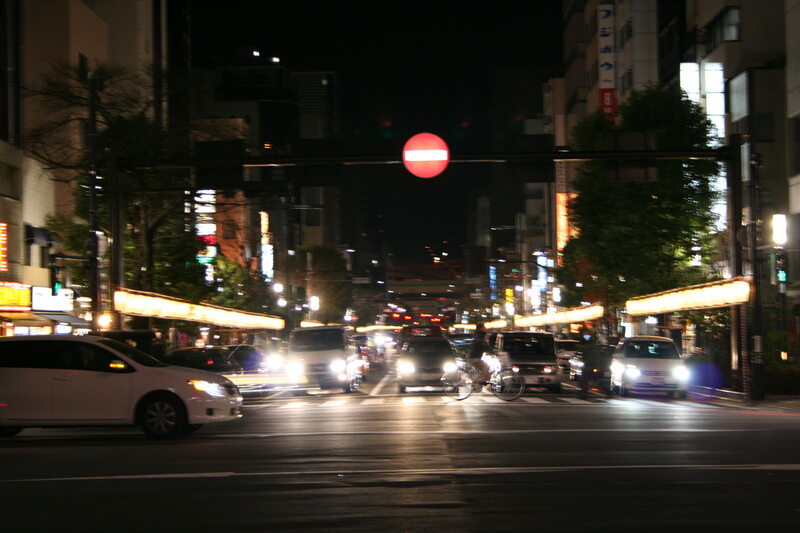 The soft lantern light along the main street is very striking, but all over lighting elements are not to the human-scale, but for traffic safety. Street lights, window light from bars and small eateries, and moonlight guided our way. 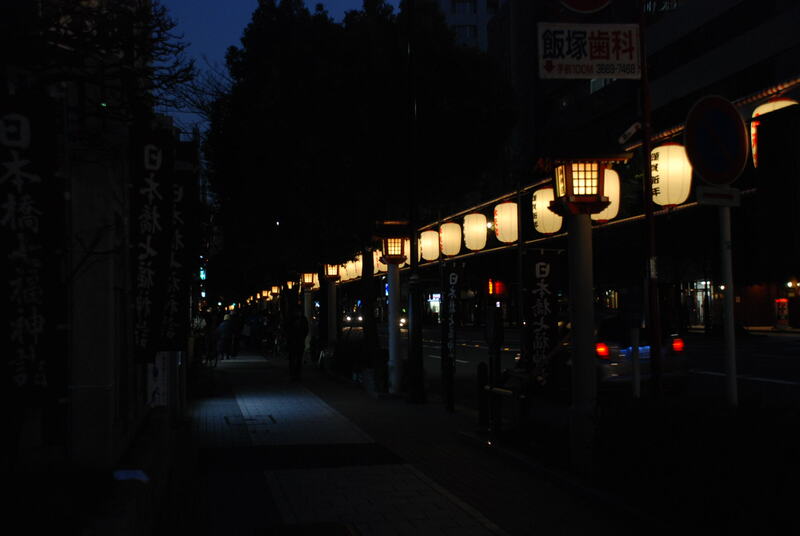 Upon leaving the metro underground, rows of softly lit lanterns line the main streets near Suitengu Shrine, quietly greeting pilgrims to the shrine. 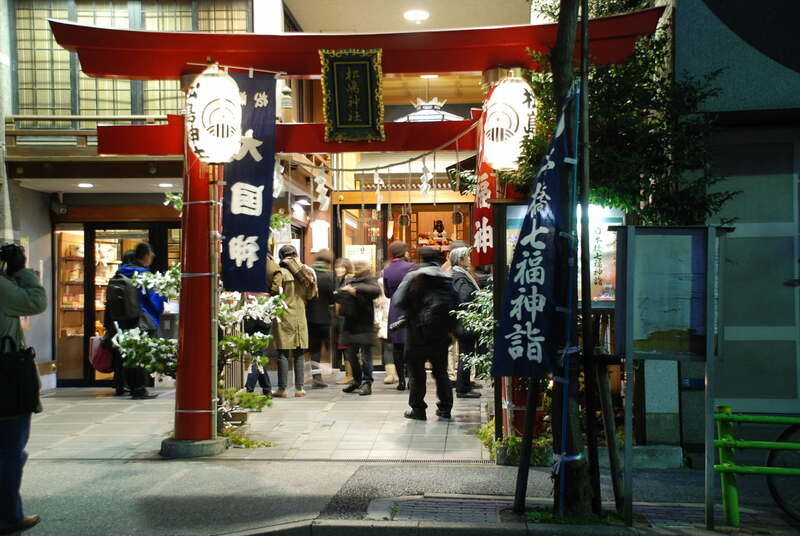 Suitengu Shrine is the only shrine on the pilgrimage to be locked in by main thoroughfares; all of the other shrines are located amongst small shops and houses. In this quiet section of Tokyo, houses and shrines stand side-by-side giving the neighborhood a very Japanese feel. My selections for most impressive shrines on the tour are Koami Shrine and Suminomori Shrine. Koami Shrine is small shrine squashed between two houses. The lighting is warm and inviting, creating a very comfortable holy area around the shrine buildings. Most lighting is very low, at foot-level, for a very relaxing environment. The main shrine building for Suginomori Shrine is painted white. A very rare decorative style, the lighting also seems to emphasize this characteristic with whitish lighting used on the shrine grounds. The shrine buildings are also decorated with very large paper lanterns, creating quite a contrasting environment from Koami Shrine. 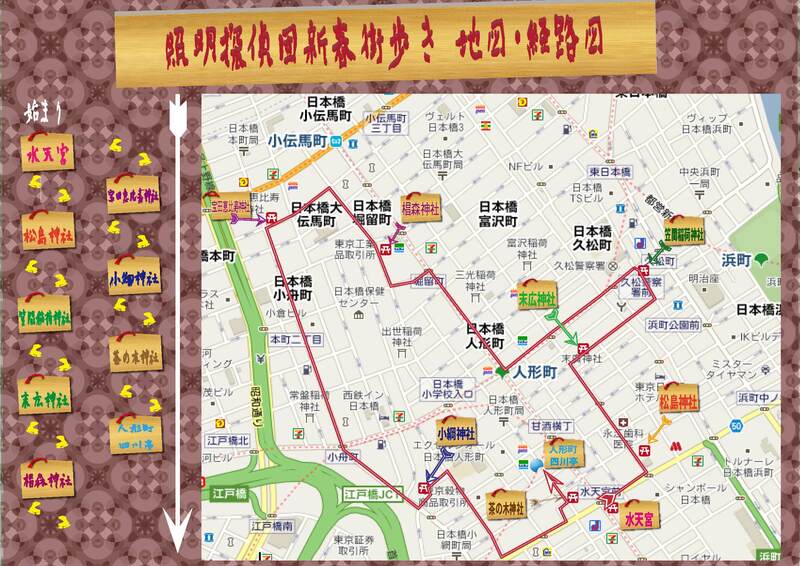 Excluding Suitengu Shrine, all the other seven shrines exist on the back streets in-between office buildings, houses, bars, and small shops. Being a Saturday, most office buildings were dark, with only a few sparse lights from bars and small eateries, street lamps, and moonlight to light our way. The warm light spilling out from the few open bars and eateries seemed very inviting along the darkened back streets. 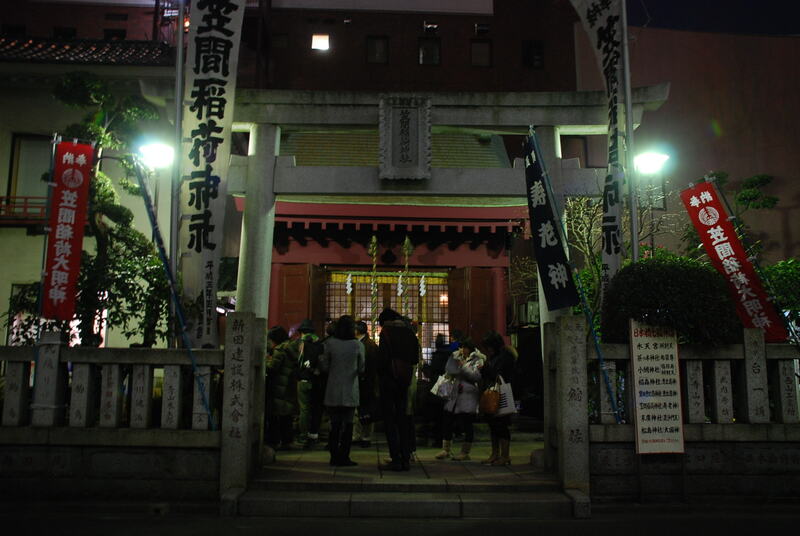 The sixth shrine along the pilgrimage was Takarata Ebisu Shrine. At first glance, it seems a very awkward shrine. It is surrounded by parking lots, probably paving over torn down houses. The building front is very shrine-like, but seems to just be that, a front attached to a regular-old-prefab building. There isn`t enough land, so the shrine gate is built right up to the property line and rope with large bell hangs over the property line right, but before the white roadway line. 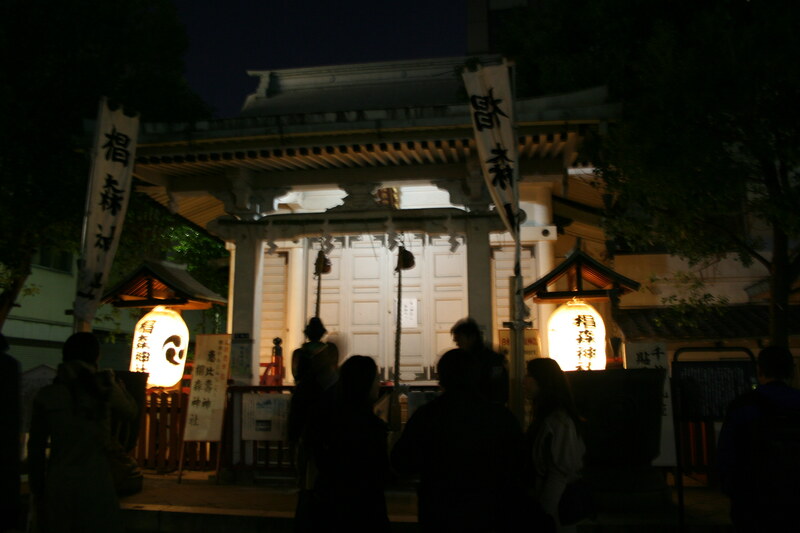 Although the street lights surrounding the shrine grounds are sparse, the area is actually fairly lit. However, the only lighting for the shrine is two large, white lanterns hanging from the building eaves on either side of the main doors. 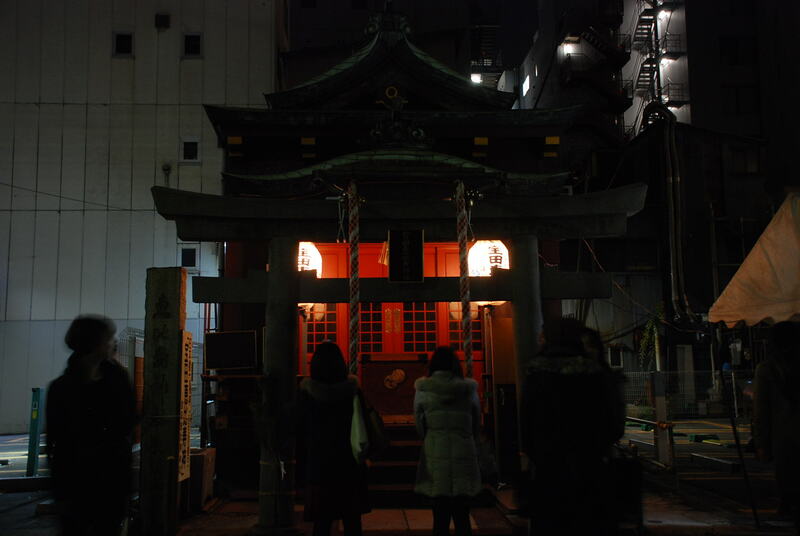 Ambient light from the lanterns shines on the bright red shrine facade and the gate, rope, and bell out front are silhouetted against simple backdrop. If you forget all of the awkwardness, the lighting is very simple and becoming of the main shrine elements. 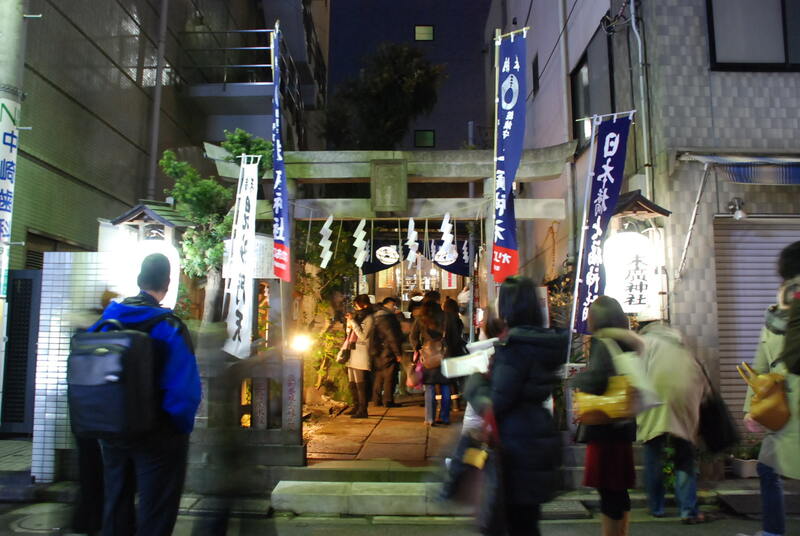 This city walking tour was a great opportunity to visit shrines in a local area of Tokyo at night. All eight shrines on the pilgrimage had very different lighting environments. Some shrines used just small, minimal light to pull in visitors, while others were more modernly equip with color-changing, programed LEDs, like Ochanoki Shrine. Koami Shrine grounds was very deep with several meters from the main gate to the shrine pavilion and room in-between for a hand washing basin, lanterns, and hall from special prayers. Soft lighting was provided in the most necessary places on the grounds and scattered across the main path for a very confident approach to the shrine, itself. 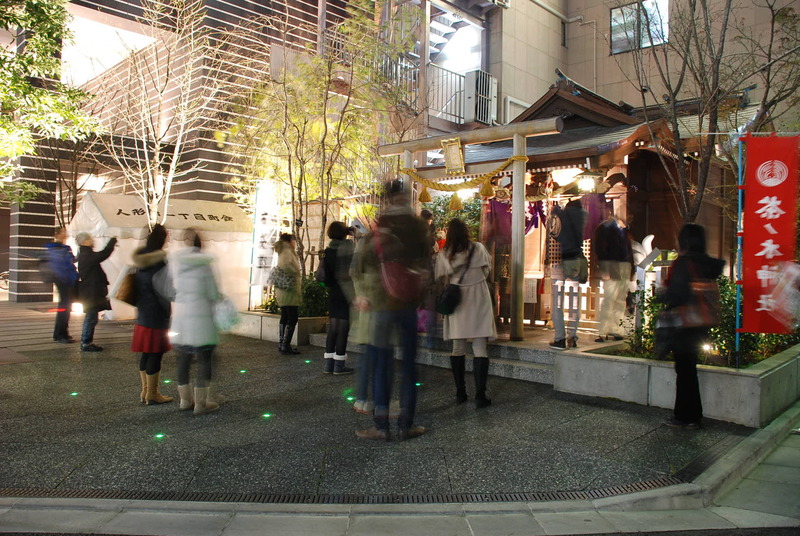 Most visitors do not come at night, so most of the shrines just did what they could with what light was provided. 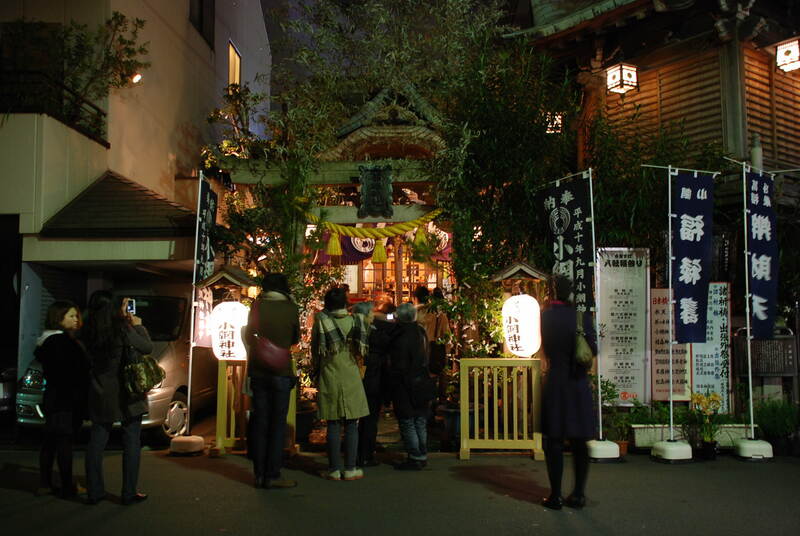 If night visits become a more regular event, each shrine should rethink their lighting and reconsider what is pleasant and acceptable light for a shrine.